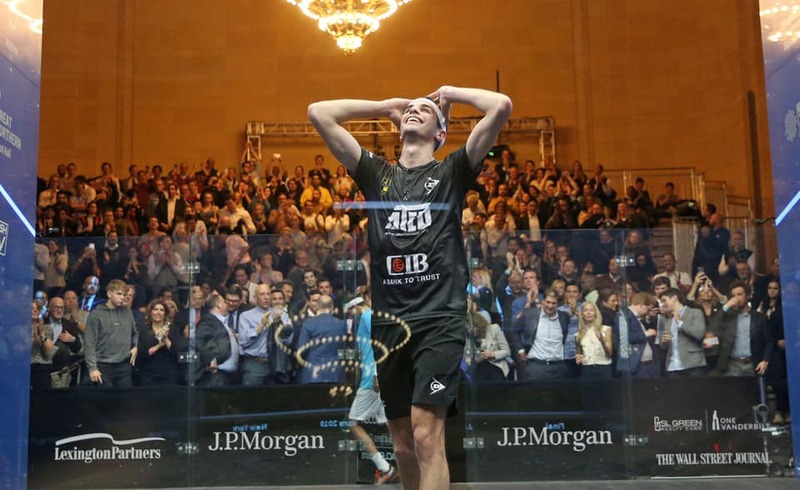 Ali Farag made history at the ToC in New York: he came back from a two-game deficit to beat Mohamed Elshorbagy, and his third win in a major tournament will catapult him at the top of the world rankings on the 1st of March, at the expense of his big rival. In the women’s event, World No.2 El Sherbini became the first woman ever to win the Tournament of Champions on three occasions after a dominant 11-9, 11-8, 11-8 victory over World No.1 El Welily which saw her retain her title. 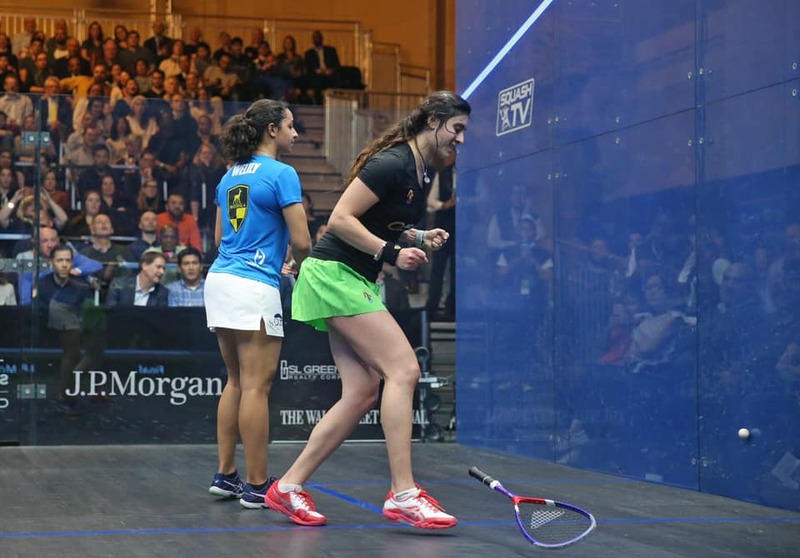 El Sherbini and El Welily were meeting for the first time since the latter had ended the former’s 31-month reign at World No.1 last month and El Welily – the 2015 Tournament of Champions winner – came into the match with a narrow 10-9 lead on their head-to-head record. But things went El Sherbini’s way this time around as the 23-year-old put on a masterclass of attacking squash to lift her 18th career PSA title, which is her first of the season. “This is my lucky place, this tournament was my first ever [Platinum] win and now it’s the first one I’ve won three times,” said El Sherbini, who also won the Tournament of Champions in 2016 and 2018. “It’s really big to put my name on this trophy and to win this tournament, but to win it three times is something that I will never forget in my life. “We’ve been battling against each other for so long, the head-to-head is 10-10, so that shows how tough it’s been. We’ve been battling in a lot of finals, sometimes it goes my way, sometimes it goes her way. 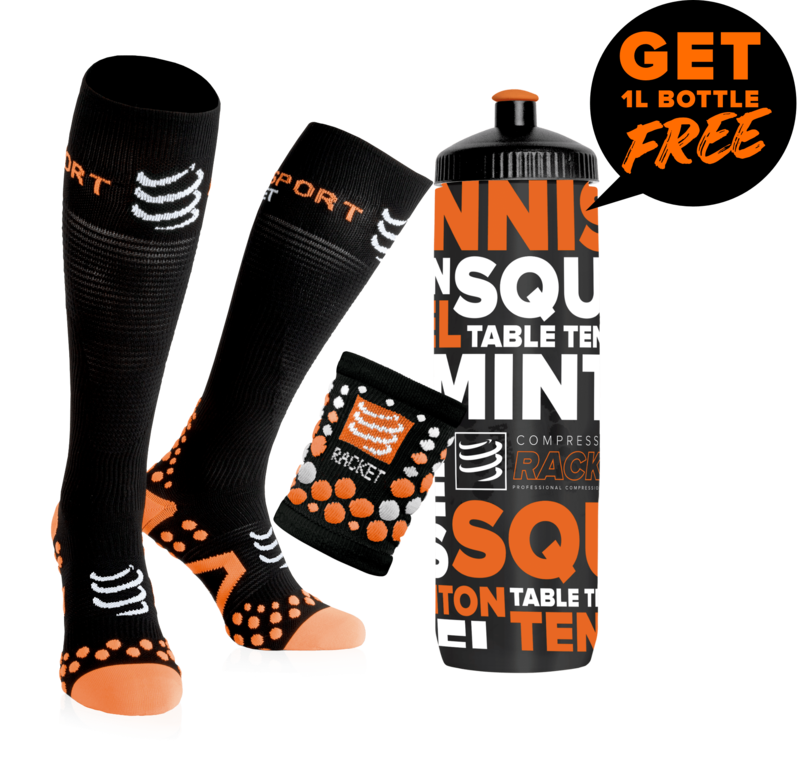 At the end of the day, the better player is going to win, and I think I was better than her today.” Have a look at our El Sherbini pack 1 bag + 2 rackets at a discount price on My Squash! Five nations shared the spoils at the 2019 Dunlop British Junior Open finals in Birmingham at the beginning of January, as players from Egypt, Malaysia, England, India and the USA lifted the coveted titles. Egyptian players claimed five of the trophies on offer, while Malaysia won two, and there was one apiece for England, India and the USA. As expected, Mostafa Asal and Hania El Hammamy clinched the title in the U19 category. After a scare in the quarters against Malaysia's Aifa Azman, El Hammamy was merciless with compatriot Jana Shiha in the final. Having already won in this age range two years ago, she ended her BJO history with a fifth title. Aged 17, Asal will get another chance to add one more line to his list of achievements, but the world champion did not cruise in the final against Nick Wall - whose mentor is Nick Matthew. Wall's silver medal was the fourth for the home country. One of the three Englishmen contesting a final, Abd-Allah Eissa edged out Malaysia’s Harith Danial Jefri after a pulsating match, to ensure that the title, held by Jonah Bryant, stayed firmly in English hands for a second year running. England’s other hope was ultimately dashed at the hands of the top-seeded Egyptian, as Sam Todd fell to Yehia Elnawasany, who, like him, had previously claimed the U13 and U15 titles. Egypt’s two other successes emerged in girls finals – with former U13 winner Salma El Tayeb upsetting the odds in the U15 event by edging out reigning champion, and top seed, Aira Azman of Malaysia 3-2. The other one came from an all-Egyptian contest, as top seed Amina Orfi defeated her second-seeded compatriot, Fayrouz Abouelkheir in straight games. Malaysia confirmed their outstanding 2018 edition with five medals, including two titles: Nickhileswar Moganasundharam justified his top seeding in the Boys’ U11 final, defeating second seed, Egyptian Chris Baddour, while second title in the Boys’ U15 event was rather less expected – with 5/8 seed Ammeshenraj Chandaran prevailing against the top-seeded Irish player, and 2016 U13 champion, Denis Gilevskiy. India’s victory provided one of the day’s biggest upsets, as Anahat Singh, seeded 3/4 in the Girls’ U11 event, triumphed over top seed Whitney Wilson of Malaysia. Finally, US Squash continued their rise during this 2019 BJO: not only top seed Marina Stefanoni became the first American girl in 17 years to claim the Girls’ U17 title, but there were 8 American players in the quarter finals, most of them in the younger categories. 154, this is the number of months during which Gregory Gaultier (now ranked 12th) remained in the squash world top 10. This streak would certainly not have ended if the "French General" hadn't been sidelined because of a knee injury, but he nevertheless holds the record and will be hard to beat. The longest ongoing period belongs to Mohamed Elshorbagy, with 110 months as of today. The "Beast of Alexandria" is still world No.1, but he will be overcome on the 1st of March by Ali Farag (see above). Having also been injured for several months, three-time world champion Ramy Ashour dropped to 35th. On the rising side, Paul Coll achieved a career-high ranking of World No.6, hence becoming the highest ranked Kiwi male since Ross Norman in 1993. Tarek Momen also reaches a career high and makes it an all-Egyptian top three after overtaking Germany’s Simon Roesner, while Karim Abdel Gawad completes the top five. Welshman Joel Makin rises four spots to No.19 – marking the first time he has featured inside the top 20. The biggest rise of the month is Fares Dessouky's, back into action after being out for 15 months: the Egyptian is up more than 400 places at 68th. It was a good month for New Zealand, since Joelle King has also claimed a career-high ranking of World No.3. In superb form this season after claiming her first ever PSA Platinum title, the Hong Kong Open in November, the Kiwi followed that up with a semi-final finish at the Tournament of Champions last month in New York to move ahead of Egypt’s Nour El Tayeb. Reigning World Champion Raneem El Welily stays at No.1 ahead of her World Championship title defence this month, while Tournament of Champions winner Nour El Sherbini remains at No.2. France’s Camille Serme completes the top five. United States No.1 Amanda Sobhy returns to the top 10. The 25-year-old was ranked as high as No.6 in the world before an achilles injury sustained in March 2017, and she will now celebrate her highest ranking since September of that year. As a result, Wales’ Tesni Evans drops out of the top 10. Meanwhile, Malaysia’s eight-time World Champion Nicol David has dropped eight places to No.21, marking the first time since November 2003 that she hasn’t featured inside the top 20. --- 128 of the world’s greatest male and female squash players will descend on Chicago for the most prestigious title in squash as they battle for a record prize purse of $1 million, which is the highest in the sport’s history: the 2018/19 PSA World Championships presented by the Walter Family at Chicago’s Union Station between February 23 – March 2. Defending men’s champion and current World No.1 Mohamed Elshorbagy has been drawn against England’s Joshua Masters in round one and is featured on the same side of the draw as three-time winner Ramy Ashour. Elshorbagy and Ashour contested both the 2012 and 2014 finals – both of which are regarded as two of the greatest squash matches of all time – and could potentially meet in the semi-finals. Ashour – who has not featured in a PSA tournament since May 2018 due to a knee injury – will play Australia’s Ryan Cuskelly in round one. The Egyptian is unseeded for the first time since the 2006 World Championships and will look to replicate his incredible title victory in 2014, where he came back from a six-month spell on the sidelines to lift the iconic trophy. World No.2 Ali Farag is seeded on the opposite side of the draw and he will take on England’s Daryl Selby in round one. Farag has the likes of Peru’s Diego Elias and New Zealand’s Paul Coll in his path to the final, while he is predicted to play World No.3 Simon Rösner in the semi-finals. Reigning women’s World Champion Raneem El Welily begins her tournament against South Africa’s Alexandra Fuller as she bids to continue her strong start to the season, which has seen her take two PSA titles so far. The 30-year-old was thwarted in the final of this tournament in 2014 and 2016, but finally got her hands on the trophy in December 2017 courtesy of a 3-1 victory against two-time winner Nour El Sherbini in Manchester. 12 months later, El Welily ended El Sherbini’s 31-month reign at World No.1 and the Egyptian duo – who contested seven PSA finals last season – are seeded to do battle in the title decider once again. El Welily is predicted to meet World No.3 Nour El Tayeb in the semi-finals, but El Tayeb must come through a difficult draw which contains 2013 World Champion Laura Massaro if she is to play to her seeding. Meanwhile, El Sherbini begins her tournament against Lily Taylor of England and is predicted to play United States No.1 Amanda Sobhy in a mouthwatering third round fixture. New Zealand’s Joelle King will also be one of the frontrunners for the women’s title. The World No.4 claimed her first PSA Platinum title in November’s Hong Kong Open and is seeded to go head-to-head with El Sherbini for a place in the final. 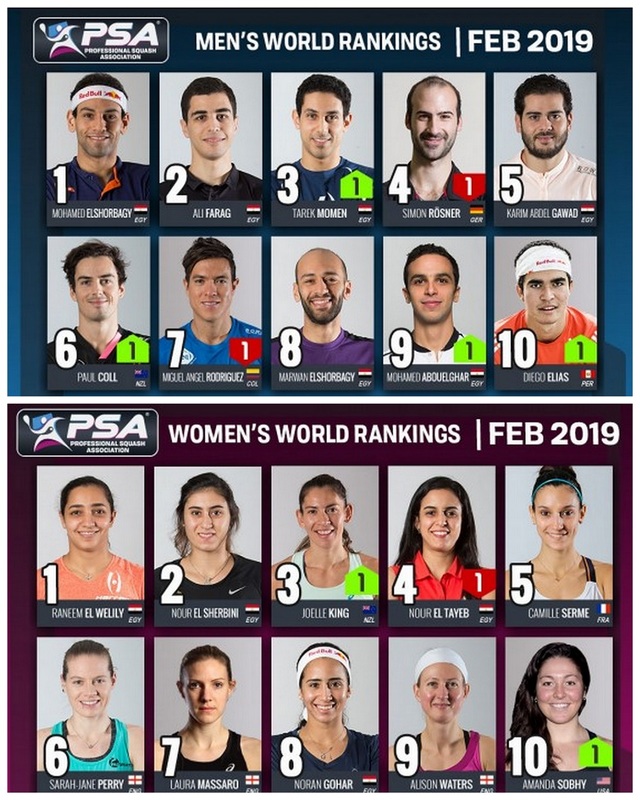 In addition to prize winnings totalling over $72,000, the winner of the World Championships will also qualify for the season-ending PSA World Tour Finals, which pits together the reigning World Champions and all seven PSA World Tour Platinum winners. The 2018/19 PSA World Championships will take place at Chicago’s Union Station, while matches from rounds one and two will also be held at MetroSquash and the University Club of Chicago. Here are the quarter finals if previous rounds go according to seedings: El Welily v Gohar, Massaro v El Tayeb, King v Serme and Perry v Elsherbini in the women's draw and Mohamed Elshorbagy v Rodriguez, Marwan Elshorbagy v Momen, Roesner v Gawad and Coll v Farag in the men's. And here also some fixtures to watch out for in the first round as far as men are concerned: Cesar Salazar v Arturo Salazar; Leo Au v Raphael Kandra; Marwan Elshorbagy v Mathieu Castagnet; Ramy Ashour v Ryan Cuskelly; Mohamed Abouelghar v Declan James; Tom Richards v George Parker; Simon Rösner v Omar Mosaad; Joel Makin v Tsz Fung Yip; Borja Golan v Mostafa Asal; Daryl Selby v Ali Farag.